Build a resilient food community, where people make more money, manage any challenge, and still grow. FRESHr is a digital food-hub. 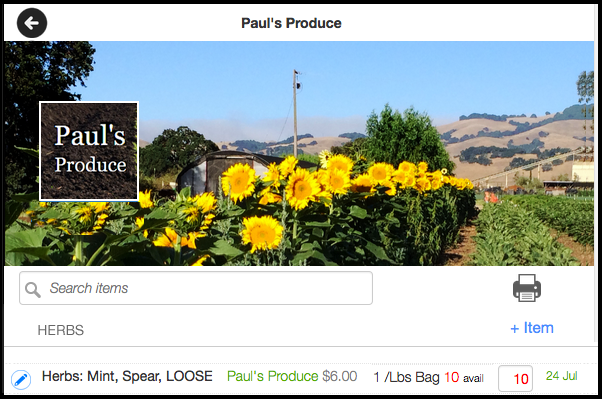 It connects farms, distributors, and chefs & grocers online, the way they do in the real world. FRESHr offers Distributors a cloud based Store. Their customers can order online from real-time availability. Distributors can easily edit and update (quantity and prices), orders, harvest-lists, pack-lists, and invoices from phone or desktop. Broadcast customers with reminders to order with delivery dates and cut-off times. 1) Just sign-up, it's free. 2) Enter your "Availability List" into your company's online Store on FRESHr. 3) Then Broadcast (Email) your customers an Invitation link to order from you online. The Calendar will automatically update your orders, telling you when items need to be picked and delivered. It can help you plan your workflow at a glance. The Calendar will automatically create invoices and enter pack and harvest lists based on orders from your customers. The ordered items can be easily edited, and payment terms and discounts can be changed at the click of a button. Create and print individual shipping and packing labels for easy use in distribution. Reports + Labels will show everything. Click on it and scroll down if you want to see invoices or just labels. Selecting Quickbooks will allow you to export data to Quickbooks. Click on the three lines on the blue bar at the top to open up page selection. From here you can select your store, view your calendar, reach out to and keep track of your customers, manage your orders, update your profile, and view reports. If you wish to personalize the icon above your name, click on it and upload a picture. Your customers will know what's available based on your store. Click the pencil icon to edit an item. Click the circle on the right to toggle an item on or off for your customers to see (the toggle will be blue and the row will be white if it is on). If you work with a distributor, a green dot will show next to the item name if it is toggled on for you but not in the distributor's store. A red dot means that the item is toggled off in your farm. You may set price tiers for wholesale, retail, and distributors by clicking on the price tiers button. Personalizing your icon and banner is as easy as clicking on them and uploading a new picture! The Search Bar allows you to find items quickly. The Time-Stamp will sort items in their categories by latest or earliest update. Clicking Print will generate a pdf version of your catalog. Use the Broadcast feature to email your Buyers a personal link to Order from your Store. The Broadcast sends an Email to your Buyers with a personal Order link for your Store. Set your next Delivery Date and Order Cut-Off Time and Date. Add Customers by clicking on the large pink + sign on the right. Enter their ordering email, name, and company name. Enter the address by clicking on the newly created customer. Customers can be sorted alphabetically or by latest update. Open Profile by clicking on the Page Selection Tab and selecting the little icon of a person under your email. Here you can enter all of your shipping and contact information which will be used for the shipping labels and invoices. You can also select if you want your store to automatically toggle off a product if other customers have already bought everything by selecting "Disabled item from store if Qty goes to 0 or less." Finally, you can enter a personalized bio of your farm for customers to read. 4. Organization Login Members (allow employees to access your account through their emails; you will retain admin control). Price (sales price to your customers.